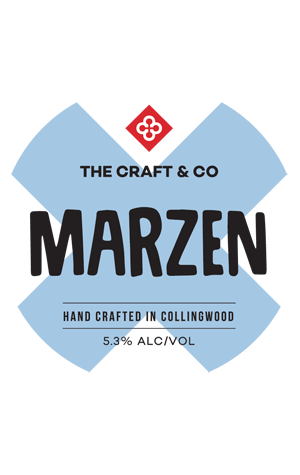 What better way is there to recognise Oktoberfest in Australia than by brewing a Marzen, the beer style most often associated with the world’s most famous Volksfest. The amber lager is traditionally brewed in March and lagered for months before being drunk by the litre9s) by the six million attendees at the Munich festival. While The Craft & Co’s take on the beer style may not be enjoyed by quite as many drinkers, there’s still much of the traditional about the beer. It pours a clear, dark amber to red hue, while aromas of sweet raisin rise instantly from the beer along with a hit of caramel. You'll also pick up a sweet, bready quality amid the beer's somewhat velvety texture yet, despite the sweetness, like the Marzens of Bavaria, the beer has a crisp and dry finish. This, head brewer Heath McVeigh says, is likely thanks to the triple decoction method of brewing – one that resulted in a 13-hour brew day. Decoction is an historical method of brewing where a small amount of the mash is taken out and heated before being returned to the main mash. This, as well as the month long lagering period, has resulted in a clean finish. Patience, after all, is a virtue.